Fermented foods – they are becoming more common in the U.S. as recipe ingredients, and as health foods. What does it mean to ferment a food? The process of fermentation occurs when sugars are converted into alcohol or organic acids by either bacteria or yeast. That’s right- the process that creates your favorite beer also produces foods like kimchi, olives, even cheese! Have you heard whispers of fermented foods being good for you? Well, the food world is definitely talking; fermented foods were one of Whole Foods Top 5 food trend predictions last year! Kimchi is one of the most well-known fermented foods. Kimchi originated in Korea, where winters are cold and fertile farm land is not widely available. Koreans salted what vegetables they had in order to preserve them. This salting and preservation process caused the vegetables to ferment. Sauerkraut is also a popular fermented food. Not just to enjoy on hot dogs, sauerkraut is a treasured ingredient in many cultures. Although thought of as a German creation, builders of the Great Wall of China enjoyed sauerkraut often and it likely spread to Europe through the plundering travels of Ghengis Khan. All of these, and other fermented foods, contain healthy probiotic bacteria. When you include fermented foods in your diet, they work with your body to help optimize the digestion and absorption of nutrients. Research has also shown that fermenting foods can make them more nutritious. For example, some foods developed Vitamin B nutrients that they did not contain before they were fermented. So exactly what do fermented foods do to benefit the body? All the action happens in the gut. The home of an estimated 100 trillion organisms, your gut is the “second brain” of your body. The gut does everything from transforming food into fuel for the body, to protecting your immune health, to lowering blood sugar. In your gut, there is a naturally-occurring compound called butyrate. 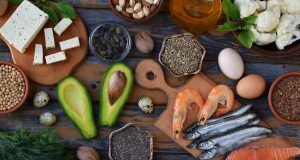 Research has shown that butyrate may have a positive impact on insulin sensitivity. When insulin sensitivity is improved, the body does a better job of regulating blood sugar and is able to keep blood sugar levels lower. When your gut works better, your body works better. 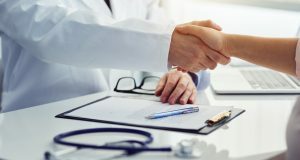 Check out this information on the power of your gut and the benefits of probiotics for diabetics. There are even more reasons to add fermented foods to your diet. Yogurt has been shown to reduce risk for heart disease, and kimchi to reduce risk of diabetes complications and obesity. If you do choose to begin including fermented foods in your diet, start slowly. As the bacteria in your gut respond, you may experience gas, bloating, and changes in bowel habits. These symptoms should last no more than a couple of weeks as your gut adjusts to the new balance of bacteria. So how many servings of fermented foods should we eat per day? If you experience an increase in the above symptoms or have stomach discomfort after enjoying a second serving of fermented foods, perhaps stick with one serving per day for a while until you acclimate. If two servings a day is working well for you, keep with it. Listen to your body, it will tell you what it needs. In large chain stores, you will likely find kombucha and tempeh in the refrigerated section near the produce department. In this same section, also look for kimchi and sauerkraut. The last two may only be available in cans, but strive to find them fresh. Canned or jarred foods have been processed with heat, which kills most (if not all) of the beneficial bacteria inside. Food labels should tell you which items contain “live organisms.” These are the winners! You can also experiment by making your own fermented foods. Online resources are plentiful, and food tastes better when you make it yourself! Just check out these these 10 foods you can ferment at home. 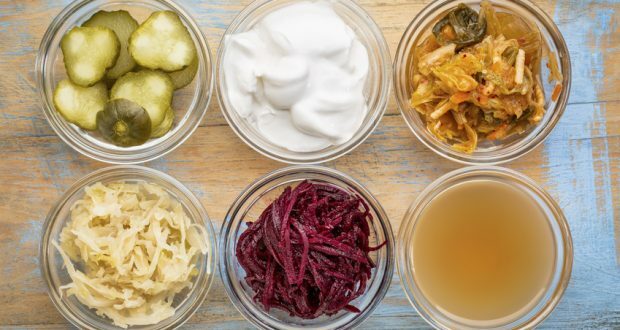 While fermented foods may feel like a step outside of your comfort zone, you could reap some seriously delicious health benefits by giving them a try! I do all the cooking. 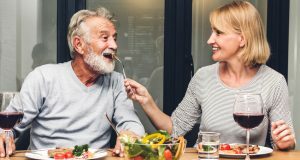 My husband has diabetes and I want to cook him healthy diabetic food.